Most earth home owners are perfectly happy with this effect and combined with the natural colouring of the ground below that the material was taken from, it simply gives their home that individual look. Some owners, however, might prefer to cover these “imperfections” with a tile, render or whatever, but that’s not part of the earth home personality type. 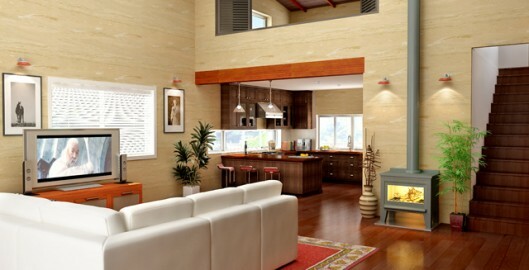 Barefoot Building Design simply loves to draw a Rammed Earth home! Why? Because of the one component factor. There is only one material required to build virtually the whole wall structure up to the roof. Walls can go almost anywhere you want, -almost as long as you want and -almost as high as you want. The most important thing in the design process is to get all your Electrical wall fixings and plumbing positions in the right place so there is no “chasing in” afterwards. Barefoot Building Design achieves this easily using the latest in CAD technology. Another great reason to build in Rammed Earth saving you plenty in Design Fees! It’s not rocket science. A well designed, solar passive home should never need an air-conditioner. Place windows as much as possible to the north to get winter sun. Eaves to let it in in winter and then keep it out in summer. Visit one in summer and the home will be nice and cool during the daytime. Then at night it will start to warm inside as it cools outside. This is thanks to the “Thermal Flywheel Effect” The walls hold their warmth for up to 12 hours before they release it slowly until the sun comes back into play the next day. Its estimated that earth homes will use only one-third as much energy as conventional homes, saving on energy bills. Rammed Earth walls have been tested to achieve the highest fire rating in Australia. Rammed Earth walls are resistant to Vermin and insects as they offer no food source or living space whatsoever. Rammed Earth walls can take most finishes available but most owners prefer it as it comes-a la natural! Hello Rob. I love what you’re doing. Would you know anyone who can do rammed earth construction in Yamba? Also I would love to talk to you about designing a house/art studio+granny flat and the cost involved in both design and construction.